I’ve tested a few higher-end robot vacuums but this one from Iiutec, the R-Cruiser, looked a bargain. We put it to work at GadgetyNews HQ. The R-Cruiser’s super-slim profile, USB charging port, and price could be enough to separate it from the crowd. However, it’s all well and good saving money as well as time on chores, as long as the robotic home-help works. The R-Cruiser is extremely compact and lightweight. It measures a slim 25.50 x 22.50 x 2.50 cm / 10.04 x 8.86 x 0.98 inches (L x W x H). It only weighs 0.7790 kg so no problems with picking it up to store away. The version we have been sent is a rather nice and clean white finish. At the front of the cleaner is a black bumper. The top features a height scanner at the front, the dust tray and then the power button. That button also indicates charge and status levels. At the rear is a microUSB charging port. This is protected by a rubbery cover. On the R-Cruiser’s underside there are a pair of front-facing brushes that you attach when you unpack it. It is bundled with a further pair of spares. There is a suction inlet that can work at up to 460Pa. You will notice there’s no rolling brushes. The R-Cruiser has been designed for hardwood, laminate, or tiled floors. Carpets and rugs are not the R-Cruiser’s friend. It is equipped with two wheels covered in grippy tyres. Finishing off the tour are edge sensors at either side and at the front on the underside the robot, and one on its right side panel. Robot vacs are really handy things for doing that regular home maintenance work. However, they have not yet got to the point where they’ll move furniture out of the way or tidy up cables. So, with that in mind, up came the rugs. After a quick check that there’s nothing on the floor that will vex the vac, I set it to work on the wood laminate in the living room and the lino in the kitchen. The Iiutec vac will only deal with dry, hard floors. There other robots that will cope with a wider range, but you will also need deeper pockets. The R-Cruiser’s low profile really makes it easy to sneak under things. I have a coffee table/storage cube on wheels, and this little bot simply slips underneath it. Other cleaning droids could not manage that. Having such a low profile is not without its difficulties though. Making the transition from living room to kitchen there is a threshold to navigate. High to low was tricky but manageable, the return journey, however, not that smooth. A robot, or any other device these days, without its own app? Yup, there’s no smart app or remote control with the R-Cruiser. Where that might seem a bit cheap, I actually see it as a nod to its simplicity. The R-Cruiser has just the one button. You press it to begin cleaning, or to turn it off. Press it a second time shortly after power-on to enter a 15-minute spot-cleaning mode. This is great if you can live without those more advanced functions such as geo-fencing areas, setting schedules, and so on. The R-Cruiser charges via a standard USB charger or a power bank, if you fancy. However, this does mean that the Iiutec bot doesn’t scamper over to its own charging dock when low on juice. On the flip side, it also means that you don’t have to find a place to hide the usually large vac dock. The vac’s battery lasts a good while. I would reckon 1 hour 45 mins use from a full charge is about fair. That should cover a few cleans before needing to recharge the R-Cruiser. In use, the Iiutec is reasonably quiet (lower than 60dB) and gets about its work without needing too much attention. That’s if you’ve done your prep right. It has various sensors covering ground, wall and height, so it isn’t too clumsy. As I’ve already mentioned, this cleaner is eapalliophobic. That is, it has a fear of rugs and mats. As the R-Cruiser is only meant to do those quick sweeps it only has a 35ml dust tray. Depending on your cleaning cycle, this will probably need emptying after each clean. Perhaps even mid-way depending on the size and dustiness of your room. The Iiutec R-Cruiser is a decent, casual robot vacuum cleaner. 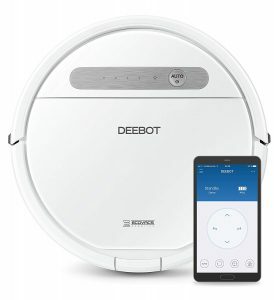 It has great battery life and works well on hard floors. Its low profile also means it can easily get under furniture. It might not have the fancy bells and whistles of more expensive models, nor a capacious dustbox, but the R-Cruiser still performs well. Ideal for conservatories, kitchens and other rooms in the home with hard floors. The R-Cruiser is available in white, black, gold or red. It is currently £99.43 from Gearbest. But, if you use this coupon code, it will be yours for £84.33!